Luke Kanowski is a young playwright— intense, magnetic, and eager for life. He escapes a disastrous upbringing in the northeast and, arriving in London, meets Paul Driscoll, an aspiring producer, and the beautiful, fiery Leigh Radley, the woman Paul loves. The three set up a radical theater company, living and working together; a romantic connection forged in candlelit rehearsal rooms during power cuts and smoky late-night parties in Chelsea’s run-down flats. The gritty rebellion of pub theater is fighting for its place against a West End dominated by racy revue shows and the giants of twentieth-century drama. Nina Jacobs is a fragile actress, bullied by her mother and in thrall to a controlling producer. When Luke meets Nina, he recognizes a soul in danger—but how much must he risk to save her? Everything he has fought for—loyalty, friendship, art—is drawn into the heat of their collision. As Luke ricochets between honesty and deceit, the promise of the future and his own painful past, the fallout threatens to be immense. Sadie Jones is the author of The Outcast, a winner of the Costa First Novel Award in Great Britain, and a finalist for the Orange Prize for Fiction and the Los Angeles Times Book Prize Art Seidenbaum Award for First Fiction; the novel Small Wars; and the bestselling novel The Uninvited Guests. She lives in London. As someone who has written for amateur theatrical productions, and been on stage as both an amateur and professional performer, I was intrigued by the description when the lovely folks at TLC Book Tours invited me to review Fallout. I’m pleased to report that that the novel was every bit as interesting as I’d hoped. It presents a view of life in theater that is both romantic and gritty, hovering on the line of each. The central characters, Luke, Paul, Leigh, and Nina all feel very real, very three-dimensional, and I could easily see any or all of them existing in that heightened reality that is show business. Because I, too, am the daughter of a strong (formidable, even) mother, I thought I would resonate most with Nina, but Nina is a fragile, broken young woman and ended up frustrating me at times. If she’d been my friend, I would have staged an intervention or two during her life. Leigh was, in many ways, the least defined of the remaining central four, but it was her practicality and (apparently) easy attitude that really drew me in. The boys (yes, they’re adults, but they’re very much still boys), Paul and Luke, reminded me of people I actually know. Luke especially so, as I have a friend from improv and audio drama who finished his university studies two years ago, and has been attempting to write and produce plays, and is the kind of young man who is oblivious when a woman is flirting with him. Sadie Jones gave us, in Fallout a plot that seemed predictable and yet was not. (I was half-expecting Luke to ride in on the proverbial white horse and rescue Nina forever), and it also showed a fairly realistic collection of romances, some less heady than others, some that lasted a lifetime, while others were clearly short duration affairs, but all of which made sense. Jones also has a finely honed sense of place in this novel. I felt the rain, smelled the greasy chips, heard the footsteps on different floors. Nothing ever seemed contrived or false. 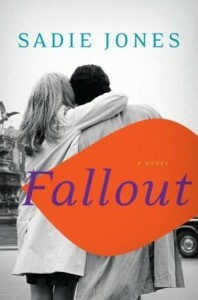 If you’re looking for a fluffy love story, Fallout is not the novel for you. If, on the other hand, you want a romantic tale based in a reality not too different from our own, with compelling, believable characters, go buy a copy right now. You won’t be sorry. Goes well with steak and salad. This review is part of a blog tour organized by TLC Book Tours. For more information, and the complete list of tour stops, click here.